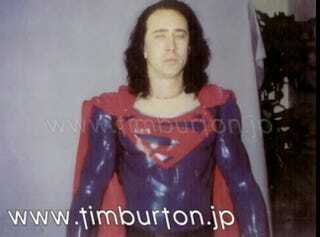 A long time ago, Nicolas Cage started a fan war when he was selected to play Tim Burton's Superman in the final adventure of the Man Of Steel. Now test pictures have leaked of the actor in the blue suit. The movie's screenplay was written by Kevin Smith and eventually rewritten by Wesley Strick. The whole thing was set to film in 1999. But after spending loads of cash, the studio eventually dropped the movie, which centered on Superman's demise. This was a good thing, because as much as I enjoy a bad Nic Cage movie, with the yelling on every other emphasis, I don't think I could handle him as America's greatest hero.